Drag across the screen to turn the object. Zoom to see details. Read more below. 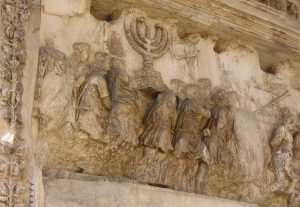 Menorahs have a very ancient connection with Judaism. The instructions for making them appeared in the first five books of the Hebrew Bible known as the Torah – the foundational text of Judaism. According to the book of Exodus (or Shemot), craftsmen were to construct them with “three branches from one side of the lampstand and three branches from the other side” (Exodus 37:18). Since ancient times, this classic shape and design have been a recognizable symbol of Judaism. The menorah at the top of this page was distributed by M. Wolozin Inc. of New York, a Judaica store that operated on Eldridge Street on the lower East Side of Manhattan. Its silver-plated branches appear to have wax stains from the dripping of candles. Rather than three branches on each side, as the Torah instructs, this menorah has four. The center is topped with a Magen David (Star of David), and it is inscribed in Hebrew with the word “Zion.” If we look closely at this menorah from the collection of the Philadelphia History Museum, what does it suggest about how it might have been used? Would it have been owned by someone very wealthy or someone of more modest means? This kind of menorah, different from the traditional Jewish menorah, is called a Hanukiah or Hanukkah Menorah. The eight branches hold the candles lit for the eight nights of Hanukkah, while the center holds the shamash, or helper candle, which lights the others. Hanukkah begins with the lighting of the shamash and one candle, and each evening a new candle is added until the final night when the Hanukiah is fully lit. Hanukkah menorahs are made in a wide range of styles from simple yet elegant designs (like the one shown here) to very intricate and elaborate. Modern Hanukkah menorahs range from the traditional to the abstract. The classic shape and design of this Hanukiah, however, is one that even the earliest Jewish residents of the Philadelphia area would have recognized. The first Jewish inhabitants of Philadelphia were a small group of Sephardic and German Jews who lived in the city in the 1730s. Among them were families that became prominent in local Philadelphia history, such as the Gratz family, for whom Gratz College was named. In 1782 this group dedicated the city’s first synagogue (Congregation Mikveh Israel) on Cherry Street, and Benjamin Franklin (1706-90) was among the donors to its building fund. For almost a century the Jewish community in the United States was predominantly German or Western European. But as the pogroms and persecutions increased in Eastern Europe in the 1880s, Jews from Poland, Russia, and other eastern European countries flooded into the major cities of the United States in a wave of immigration that lasted from 1880 to 1924. 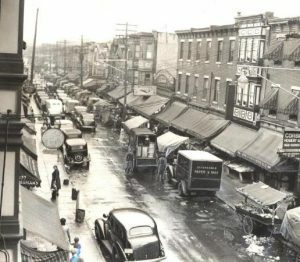 Philadelphia was no exception, and the established German/Jewish community in the city was inundated with refugees who were foreign to them in almost every way. They dressed differently, they worshiped differently, and they even spoke a different language – Yiddish. The large numbers of Jewish immigrants forever changed Jewish life in Philadelphia and the nation. One of the many Jewish holidays the Robboy family would have celebrated was Hanukkah, with this Hanukiah. The holiday was not prescribed in Jewish scripture like Passover and Yom Kippur, but it became a celebration of Jewish resilience in the face of persecution. Rabbi Joseph Telushkin, in his book Jewish Literacy (1991), commented that it is indeed “one of the happiest Jewish holidays.” It recalls the oppression of the Jews by the Seleucid ruler Antiochus IV Epiphanes (215 B.C.E.-164 B.C.E. ), who sought to outlaw Judaism and put idols in the Jewish temple in Jerusalem. In 166 B.C.E. the Jews, led by the Maccabees, rebelled and purified the Temple by destroying the idols. When they sought to light the menorah, they had only one container of oil—enough for one day. According to the story, that one flask lasted for eight days, and the Hanukkah Menorah has eight candles to commemorate that miracle. Hanukkah was not a major holiday on the Jewish calendar until the twentieth century. However, Hanukkah played an important role for new Jewish immigrants to the United States, who associated Christmas with a potential for violence, such as the attacks on Jewish businesses that occurred at Christmastime during the Warsaw pogrom of 1881. In the new world, “Hanukkah served as a counter-balance to this fear of Christmas in Jewish communities,” wrote Emma Green in her article “Hanukkah Why?” in the December 2015 issue of The Atlantic. In Philadelphia, the Jewish community was free to worship without fear. If we try, we can imagine Mendel Robboy, his wife, Anna, and their children, gathered around this Hanukiah, celebrating the miracle of oil and celebrating their new lives, their faith, and their new freedom in America. Text by Leslie Peck, who earned a master’s degree in history at Rutgers University-Camden.